The very first manure spreader was invented in 1859 by Joseph Oppenheim. However, the first use of actual manure spreader chains was not used until 1875 when the first successful automated manure spreader was designed by Joseph Kemp. Manure spreaders deeply rely on the proper operation of the chain to successfully distribute manure over a field. Without successful operation a field may not be fertilized properly or in a timely manner which can impact the whole operation. At USA Roller Chain and Sprockets we realize the importance of manure spreader chain. 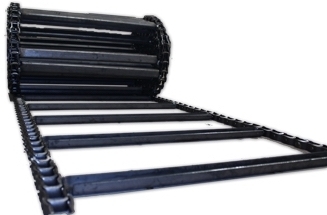 All of the manure spreader chains we offer (including T-rod & T-bar styles) are manufactured using heat-treated components for maximum durability and strength. We supply plain manure spreader chains as well as direct OEM replacements with attachments assembled onto it. Not only do we supply the chains, we also have bearings, shafting, gear boxes, motors, and much more! To get a quote and to check availability please contact us and someone from our customer service team will be happy to assist you.